Apache Junction is a suburb of Phoenix where we enjoy the blessing of having family who are winter denizens. Being located at the very southeast corner of the sprawling breadth of Phoenix, we were close to the Salt River and the Superstition Mountains. It was a first class tour that took us to see the mountain range, and to watch the warm glow of the setting sun reflected off of the Superstition Mountains. According to wikipedia, the legend of the Lost Dutchman’s Gold Mine centers around the Superstition Mountains. The legend claims that a German immigrant named Jacob Waltz discovered a mother lode of gold in the Superstition wilderness and, on his deathbed in 1891, revealed its location to Julia Thomas, a boarding-house owner who had taken care of him for many years. Several mines have been declared as Jacob’s, but none have been verified. 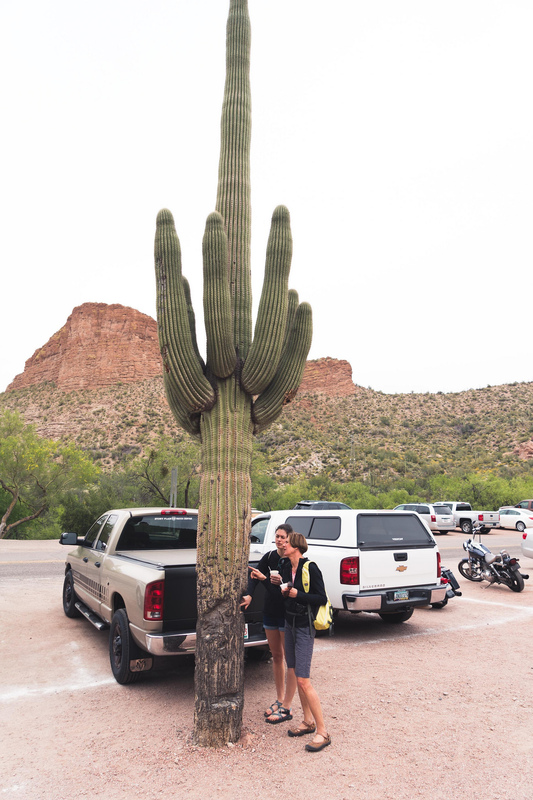 The legends and lore of the Superstition Mountains can be experienced at the Superstition Mountain Museum on the Apache Trail, where artifacts of the Lost Dutchman are on display. Some Apaches believe that the hole leading down into the lower world, or hell, is located in the Superstition Mountains. Winds blowing from the hole is supposed to be the cause of severe dust storms in the metropolitan region. The Superstition Mountain range at sunset. Growing only in the Sonoran Desert are the iconic Saguaro cacti (Carnegiea gigantea), pronounced “sah-wah-roh”. A trip to this area is not complete without examining of one of these famous desert plants. 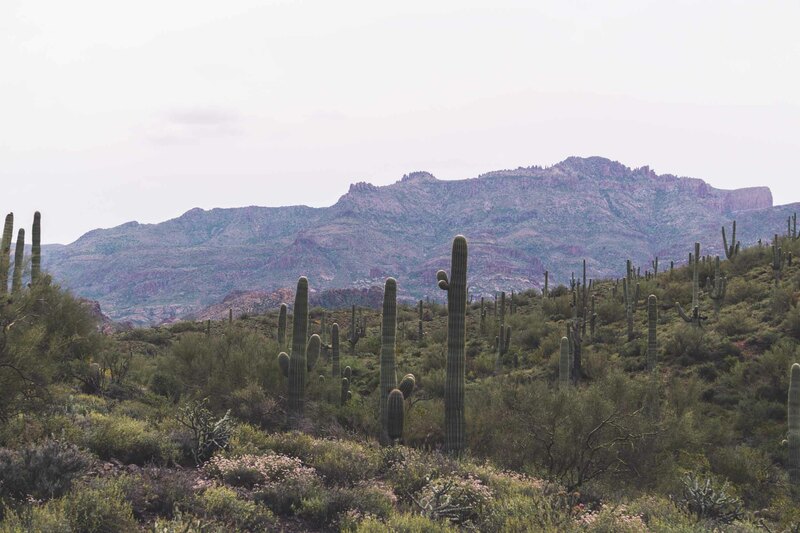 According to a legend of the local Tohono O’odham nation, these giant cacti are not plants, but a different type of humanity, and are viewed as respected members of the tribe. The Saguaro cactus has become a symbol of the American West. As a desert indicator species, the range of the saguaro cactus is limited to southern Arizona. You can read more about the species by clicking here. These cacti can grow to over 70 feet tall, weigh over a ton, and live between 100-200 years! Sedona was a brief stop on our way to Page, a place to stretch our legs and have lunch. Initially we were going to hike to Cathedral Rock, but due to time constrants we decided to enjoy a brief walk along the river, take a few images, and move along. 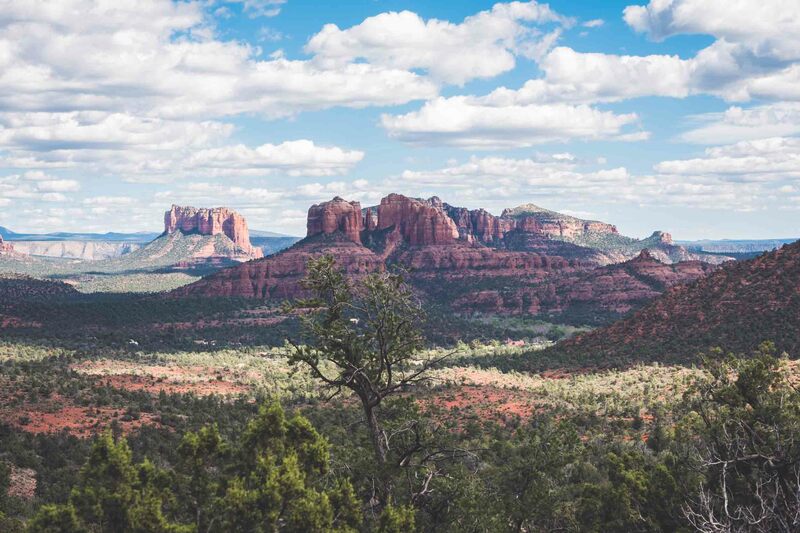 Sedona is known for the scenery of its rocky red promontories. Page was a good home base for some day trips. On our first day here, with 100% chance of rain squashing our planned trip to Monument Valley, we improvised and headed out for an adventure. Heading south from Page on US89 toward Vermillion Cliffs, we had no schedule or plan for the day except to explore and see what we could see. Horseshoe Bend was an interesting place, but very busy at sunset with tourists (like us!). Stopping on the way to Zion we hiked, jumped, and bouldered through an area with interesting formations called “toadstools”, which are larger rock pieces on top of more narrow ones. 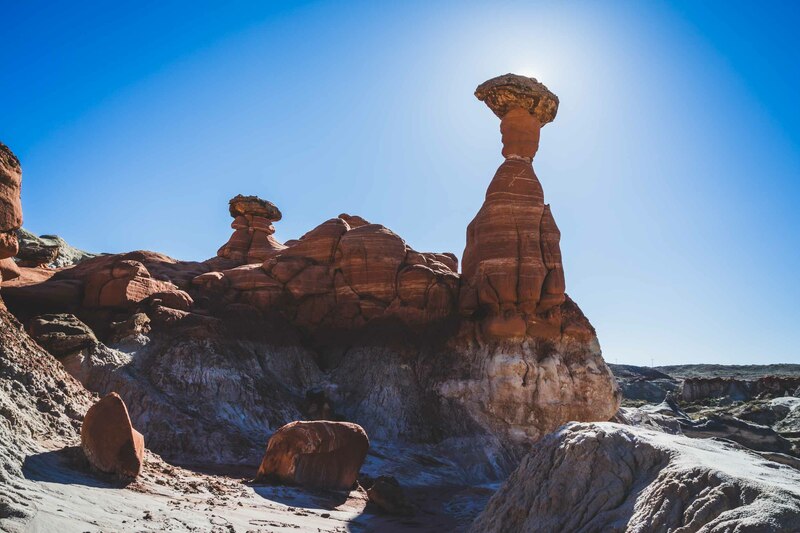 The traditional explanation for the existence of these top-heavy monoliths is that softer rock layers have eroded below harder rock layers, but some looked as if a boulder had been randomly plopped on top of a column of stone. The sky on this day was a very saturated and dark blue, which was a beautiful contrast to the red rocks. Our dawdling was intentional as there had been snow the day before, and we couldn’t find the spirit to venture onto high and narrow trails that we imagined would be icy. But Zion is a very popular place. In hindsight we should have arrived at sunrise and we would have avoided the mass of people later in the morning. At the end of the Canyon Overlook hike. The consequence of our hesitation was a second day of unscripted adventure as we could not follow through with our plan to hike to Observation Point. We were finally able to park and make our way to a shorter and more well-traveled path, and then went off the map, so to speak, and did a little independent bouldering. Sometimes the best adventures are the spontaneous ones! 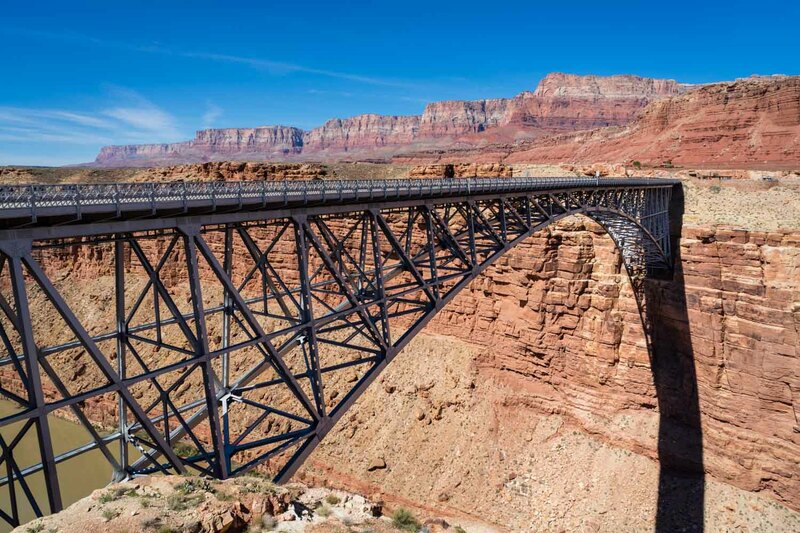 The plan for today: pack up and head to Waterhole Canyon, Navajo Bridge and Lees Ferry, ending up at the south rim of the Grand Canyon. 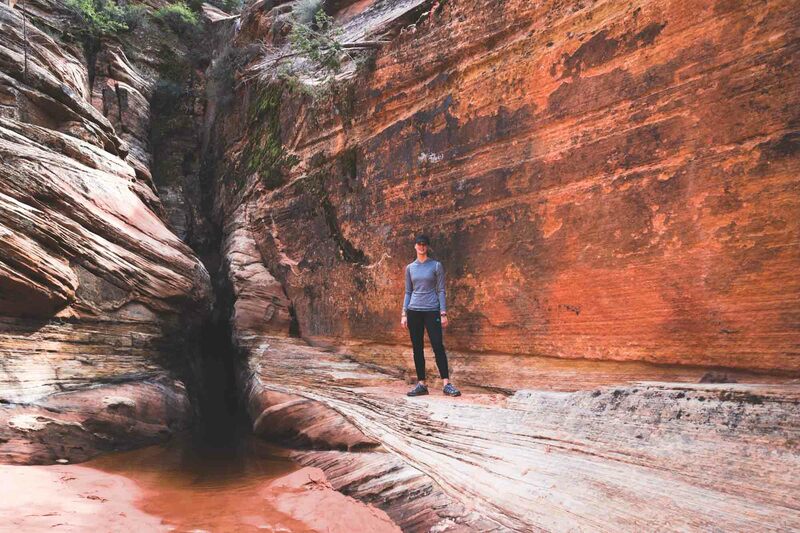 Waterhole Canyon, a slot canyon, is a pathway formed by rushing water which creates a formation that is beautiful, fascinating, and daunting all at the same time. Sandwiched between two serpentine walls of rock, one never knows what is around the next corner, and the only way out is back the way you came. Of course the allures of a slot canyon are the very things that make it precarious: the beauty of the surroundings, and the adventure of the unknown. And such is life. The next stops: Navajo Bridge and Lees Ferry. At Lees Ferry, a state park on the Colorado River, one can see evidence of human habitatation as there had once been gold mining activities at that place. Hiking a more natural pathway, the Cathedral Wash is a natural storm wash which serves as a trail when it’s dry. It wasn’t until we reached the end of the trail that we discovered its namesake. We used the towering stone backdrop as an opportunity for a family picture. The namesake of Cathedral Wash is a cathedral-like setting which we used as a place for a family picture. What is it they say about learning from ones mistakes? We were up bright and early to hike the South Kaibab. We weren’t alone. This was also the time that the serious backpackers were making their way down into the canyon. This trail is pretty technical with a very steep drop in elevation, making it, arguably, more difficult on the descent than the ascent. We hiked about 7 miles this day which was enough considering the steep nature of the trail. It was interesting to see the landscape change as the sun rose. As we descended the trail into the canyon the shadows were long and it was chilly in the mountain’s shadows. On our return trip the shadows were gone, and the temperatures began to climb. The vistas of the Grand Canyon from the rim are spectacular. To understand the enormity of the canyon and to truly appreciate this creation, one must venture down, the further the better. It is amazing! A brief stop to take in the sights early on in our hike into the canyon. As I was planning this portion of our trip I read repeated warnings about the trails being narrow and on the edges of steep cliffs, so I spent a fair amount of time preparing my family. Has anyone ever hiked the trails above Lake Superior at Pictured Rocks? To do this is to learn the definition of hiking on a precipice. 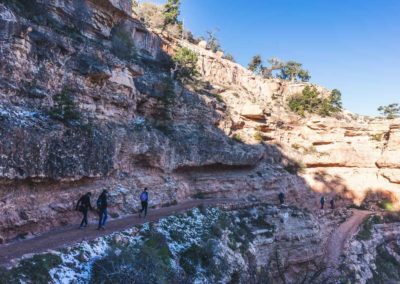 In other words, on the South Kaibab and then the Bright Angel trail, we never felt uncomfortably high or exposed to the risk of falling. All twelve miles of it! That’s six miles down and six miles up. Twelve miles of some of the most beautiful scenery we have ever experienced. It’s an experience because when you go into the canyon you become part of it. You are contained by it. You breathe it’s air and it surrounds you. You are set apart from those on the rim. We could have gone further, but heeded warnings not to attempt to hike to the river and back in one day. As they say, going down is optional, but coming back up is mandatory. We shared the Bright Angel with hikers of various shapes, sizes and abilities, some only heading to the 1.5 mile point, some, like us, going all the way to Plateau Point which overlooks the Colorado River. The 4.5 mile stop along the trail is called Indian Garden, an actual oasis in the arid canyon. Here we found water to fill our containers and a stream to put our feet in, which felt wonderful. Early April was, in my opinion, the perfect time to come. The cacti were blooming, and the temperatures were mild. Is it a rattler? Nope, just another concern that turned out to be for naught! 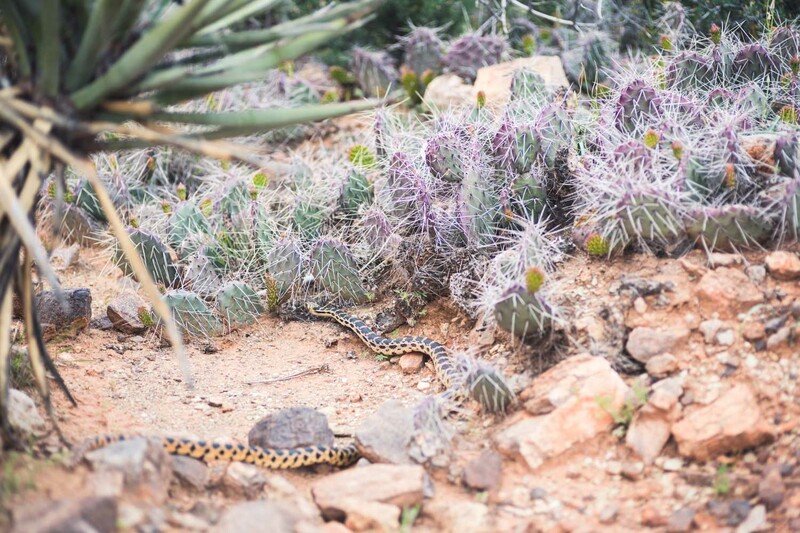 The spikes on the cacti turned out to be the greater threat, but we avoided these as well.